In 2010, there were 7 new posts, growing the total archive of this blog to 126 posts. There were 29 pictures uploaded, taking up a total of 2mb. That’s about 2 pictures per month. The busiest day of the year was September 11th with 104 views. The most popular post that day was The Lady’s not Gaga anymore!. The top referring sites in 2010 were en.wikipedia.org, search.aol.com, and stumbleupon.com. Some visitors came searching, mostly for boston music group, movie reel, rob fusari, randy goodman, and boston group. My belated Father’s Day gift this year was a brand, spanking new iPhone 4 32mb! So, now that I’ve been using it for about two weeks, I decided to share my thoughts and insights, particularly since I’ve previously blogged about my love/hate relationship with Apple and the predecessor phones. I am a staunch Windows 7 user, and have my doubts about the seriousness of anyone who uses the Apple operating system! Just kidding really. Without a doubt, the first thing you notice about the new iPhone is the superior clarity of t he 960×640 screen. It’s brighter, fonts are clearer, pictures more vibrant and, overall, it’s simply much more impressive. Don’t’ take my word for it, hold one up next to your old iPhone and you’ll see the difference instantly. The 480×320 screen on the older phones appear almost muddy by comparison. Apple doubled the pixels per inch, and it shows. They also increased the contract ratio to 800:1. In the end, the resolution upgrade alone is worth the price of admission! The next design element I noticed was the shape. 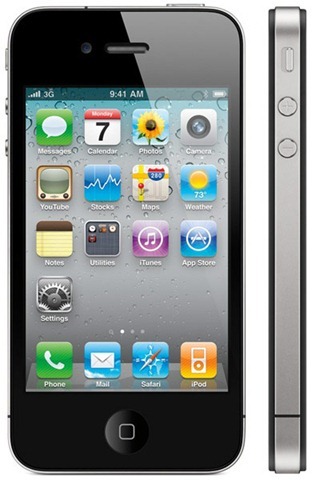 The new iPhone 4 is very distinct from its predecessors in its very UN-zen-like feel, stepping toward a more “slate” type approach. That can be either a good or bad choice, depending upon your perspective, and how much you liked the original Zen-like design. I personally really liked the “Zen Stone” feel of the original, with it’s rounded back and corners. My previous model was the white 3g (oh, sorry Apple, I probably shouldn’t mention the “white” right now huh?). That said, the new shape and feel have grown on me and I actually like the new aesthetics, although it did take some adjustments in my holding style. The new model is much starker, with metal edges, creating an almost industrial feel (the very same edges that give the iPhone 4 it’s trademark reception problems). The phone is more slender than its predecessors as well, which gives the misleading appearance of a smaller screen. It’s not – actually they are identical in size at 89 mm. The edges also give the appearance that the 4 is thicker than its ancestory. Again, it’s not. It’s actually shaved thinner – 2 mm to be precise! Putting aside the incredible screen, the next real beauty of this new model is the software revisions. Many of my faithful readers will recall my constant berating of Apple about the lack of multi-tasking, something the very first Palm Pilots could pull off with ease. So, how many years and version upgrades have we been through? Having poked at the giant enough, I will state unequivocally that Apple’s implementation of this mission critical component is very well done. Two clicks on the home button and up pops a menu at the bottom showing all running applications and allowing you to move between them. One can, for example, read a book and take notes, or time a runner and jot down the time. I know, these seem like simple, ordinary tasks, but try that on an older iPhone! One feature of multitasking that would be an improvement in future version, however, is the ability to shutdown all applications without having to individually close them. After several hours of use, the multiple applications begin to pile up and exhaust valuable resources. But, that caveat expressed, I am SO happy to have multi-tasking on my iPhone. I was beginning to miss those days with my Palm. Another one of my expressly desired features that did NOT appear on this new model is the week view in the calendar. It might sound like a petty request, but in the business world, many people rely on the week view for advance planning and scheduling. And please, don’t tell me about the “List” view – a more useless apparatus I have never witnessed – it is simply not a replacement for the week view! Ironically, Apple HAS implemented the weekview feature on its enigmatic iPad. I was so put out when I found this. “So, why can’t I have it too?” I asked The “Genius” at the store. She tells me it is planned for a future version, but I don’t know if I trust The Genius. Apple’s sin is further amplified by the fact that because of its proprietary philosophy it will not allow third party software designers to access the code to their precious default programs, so no one can even design a work around! Pocket Informant has a beautiful weekview in its application, but you are relegated to using Google Calendar, not the Apple default. So, this complicates issues with Exchange servers and is not a good work around. Ok, so enough of my bitching, let’s get back to the many things I LIKE about the 4! Let’s talk folders! Another sadly missing item was rectified by the new operating system by the addition of the foldering system. Now, instead of 10 or so unorganized pages containing a hodge podge of programs, I have one main screen with my most utilized programs, and a page and one half of folders! An organizational system in a Personal Information Manager, imagine that! It’s truly great. There are, of course, many other wonder additions on the iPhone 4 – the 5 mp camera and front facing camera, video conferencing, gyroscope, etc. – but these are my initial thoughts. Over the next few months, I will be sharing some of my favorite applications on the iPhone with you, but suffice it to say that the new iPhone is working out quite nicely. I highly recommend an upgrade if you’re considering it and/or are waivering. There is a a good comparison at Wikipedia. Editors Note: The following is a research paper from one of the students in my Entertainment Law & Licensing class I teach at Belmont University’s Curb School of Music. On July 30, 1998 Tivo Inc. registered a patent for their multimedia time warping system that allows a user to store selected television programs while simultaneously watching or reviewing another program. They patented their process for making this then phenomenon so as to protect their discovery and to become the exclusive financial beneficiaries of this technology. In 1999 it was announced by Dish Network that along with their affiliate Echostar would soon have the time shifting abilities that Tivo was spearheading. This was the warning sign of what would end up being years of court battles between Tivo and the Echostar-Dish Network team. Tivo filed suit for patent infringement in January of 2004, once they realized that the patent they obtained was being violated, to seek financial retribution and an injunction against Echostar to halt the production of infringing DVR systems that they were producing. Tivo alleged that Echostar was infringing two software claims, “The process for the simultaneous storage and play back of multimedia data, and the apparatus as well” (Tivo v. Echostar, 2). In addition to the software claims, Tivo asserted that Echostar was violating their hardware patent as well. (Tivo v. Echostar, 3). In addition, the court awarded Tivo $74 million in lost profits. At that time, Echostar did not appeal the permanent injunction imposed by the court, but it also did not discontinue providing the DVR service. In response, Tivo requested that the district court hold Echostar in contempt. Echostar claimed that it redesigned its product so that it was not infringing any longer. Dish and EchoStar had argued that it was entitled to a trial to determine if its altered products infringe the patent. The company said it “paid 15 engineers to spend 8,000 hours on the redesign, which took a year” (Decker and McQuillen). Tivo argued against this point saying that the changes made to their DVR players do not make a “colorable” difference. ( Tivo v. Echostar, 12). Echostar claimed that the injunction was unclear, but Tivo claimed the opposite and the record of the court reflected the clarity of the injunction. Also important to note is that the DVR’s time warping software was the only aspect of the boxes required to be disabled; not all of the actual units and hardware, the DVR functionality is just one of many functions that the Echostar Broadcom and 50X receivers performed. Since Echostar never directly appealed the injunction it was judged as a lost cause for them and the court fined them nearly $90 million and amended the previous injunction requiring EchoStar to seek the court’s approval before implementing future DVR software. The final decision by the Federal Court of Appeals was to uphold the decision made by the district court in a divided 2-1 decision. TiVo said it will be entitled to a total of about $300 million in damages and contempt sanctions through July 1, 2009, and it will seek additional cash for continued infringement after that date. That’s in addition to $100 million Dish paid TiVo after the original appeals court ruling (Decker and McQuillen). While it is a victory for Tivo, they only got a portion of the $1 billion they were seeking. This case made a huge impact on the DVR industry as well as Tivo’s stock, which skyrocketed following the May 4th decision by the federal court. Tony Wible, an analyst with Janney Montgomery Scott LLC in Philadelphia, wrote in a note today. “The courts have ruled in TiVo’s favor numerous times over the past five years, which should help the company in the company’s litigation against AT&T, Verizon and Microsoft” (Decker and McQuillen). It is a good that courts are protecting intellectual properties such as Tivo’s patent in this case, so as to discourage the stealing of ideas and encourage the promotion of innovative thinking. The court’s decision to find EchoStar in violation was a good decision, as Tivo should be the sole beneficiaries of their intellectual property, i.e., the patent. To play devil’s advocate, however, such decision does stifle competition in the industry, namely, EchoStar was the only true competing DVR provider with any clout. Generally speaking, it is not good to promote a monopolist environment in any industry. This is essentially the state of the DVR industry until Tivo’s patent expires in 2018. This decision confirms the principal that the twenty years of exclusive ownership granted by patent law is a positive thing—without that right someone could easily profit off of another’s innovation and inventive nature. It is reassuring to see that judges like those in this case are still interested in the protection of important intellectual discoveries such as Tivo’s time warping technology. It also also reinforces the fact that courts will enforce their injunctions against parties and do not take it lightly when a defendant tries to skirt the injunction or slyly work around it. EchoStar’s was penalized an extra $90 million because they tried to do things their own way and work around the court. These proceedings took over five years, but Tivo still has many legal proceedings ahead of them, probably enough to last the entirety of their patent ownership and beyond! Nonetheless, the EchoStar decision is the most positive sign that Tivo could have received in the midst of the myriad of legal battles they are still facing. This case proves that if one want to protect valuable ideas and methods they had better be ready to fight tooth and nail in the court system for years on end—luckily the reward can be great. Tivo v. Echostar. No. 2009-1374. U.S. Court of Appeals for the Federal Circuit. 4 March 2010. Decker, Susan, and William McQuillen. "TiVo Wins Court Ruling Against Dish, EchoStar (Update4)." Businessweek.com. Ed. David E. Rovella. Bloomberg, 4 Mar. 2010. Web. 11 Apr. 2010. Grant Guinane is a recent graduate of Belmont University. He obtained a B.A. 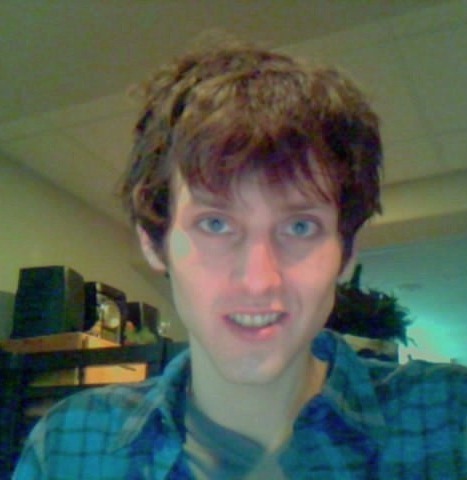 in Entertainment Industry Studies with a focus in writing and music, as well as a minor in marketing. Originally from St. Joseph, Michigan, Grant came to Nashville to pursue music. He currently lives in Detroit, Michigan. The U. S. District Court for the Southern District of New York ruled against LimeWire and its parent company, Lime Group, finding them liable for inducement of copyright infringement based on the use of their service by subscribers. U.S. District Judge Kimba Wood issued the 59-page decision Wednesday, siding with the 13 record companies that sued Lime Wire LLC and founder and Chairman Mark Gorton through the RIAA claiming copyright infringement and unfair competition. In finding the company liable, Wood opined that LimeWire had optimized its application to "ensure that users can download digital recordings, the majority of which are protected by copyright," and that the company actively "assists users in committing infringement." Wood also found that the defendants knew their technology was being used to download copyrighted tunes and took no "meaningful steps" to prevent the infringement. In addition, Lime Wire marketed its software to people "predisposed to committing infringement" and assisted those people, the judge ruled. Major labels, as represented by the RIAA, were predictably thrilled with the outcome. "This definitive ruling is an extraordinary victory for the entire creative community. The court made clear that LimeWire was liable for inducing widespread copyright theft," RIAA chairman and CEO Mitch Bainwol relayed. "Lime Wire remains committed to developing innovative products and services for the end-user and to working with the entire music industry, including the major labels, to achieve this mission," Searle said. Searle did not say whether Limewire would appeal the ruling. 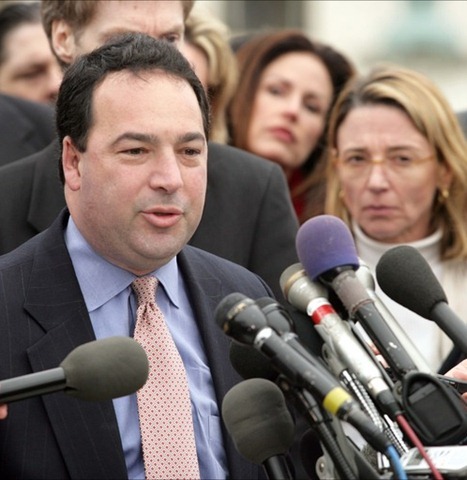 The Recording Industry Association of America proclaimed the decision was "an important milestone" in the battle against online copyright infringement, because Gorton was found personally liable, in addition to the company of which he was the chairman. Personal liability against a corporate director is rare. "The court has sent a clear signal to those who think they can devise and profit from a piracy scheme that will escape accountability," Mitch Bainwol, chairman and chief executive of the RIAA, said in a statement. LimeWire, launched in 2000, is one of the largest remaining commercial peer-to-peer services left on the Web. The company claims to have more than 50 million monthly users. The company has managed to defend itself against major label legal action for years. The record companies that sued Lime Wire included Arista, Atlantic, BMG Music, Capital, Elektra, Interscope, LaFace, Motown, Priority, Sony BMG, UMG, Virgin and Warner Brothers. The Lady’s not Gaga anymore! Producer/songwriter Rob Fusari recently filed a $30.5 million lawsuit against Team Love Child, LLC and Mermaid Music, LLC, two companies co-owned by the Grammy Award-winning pop star, Stefani Germanotta, professionally known as Lady Gaga, currently a very popular and controversial pop artist. The complaint alleges that Lady Gaga “froze” him out of her career and is reneging on their business arrangement despite the fact that he played a pivotal role in launching her career in the early years – i.e., co-writing songs, creating her stage name, and helping her obtain her record deal with Interscope Records. Specifically, the suit alleges claims of breach of contract and fiduciary duty. "The realization of Gaga was five years ago, but Gaga’s always been who I am…I always dressed like that before people knew me as Lady Gaga. I was always that way…I stuck out like a sore thumb." The lawsuit further claims that Lady Gaga and Fusari’s relationship turned romantic and then ultimately became a business partnership in May 2006. It was around this time that they created Team Love Child, LLC. In the formation of this joint venture, Fusari and Germanotta agreed to allow Fusari to collect producer fees in addition to 20% of the earnings from Germanotta’s first four albums. While Fusari acknowledges that he received checks totally approximately $611,000, he nonetheless claims that he has been denied what the Team Love Child, LLC agreement entailed. Essentially, the lawsuit is mainly fighting for the aforementioned agreement. Alternatively, if the court does not nullify the agreement, the complaint seeks a declaration that Fusari is only entitled to a percentage of net compensation, that he is not entitled to a percentage of merchandising income, and that he Lady Gaga is not required to use him to produce future albums. This case is ongoing and Fusari’s answer in the latter case has not yet been filed. The Lady Gaga complaint can be downloaded here. 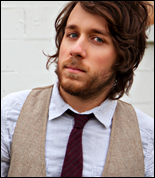 Josh is a Knoxville, Tennessee native who attends Belmont University’s Mike Curb School of Music Business. He is currently a student in Mr. Shrum’s Entertainment Law & Licensing class. 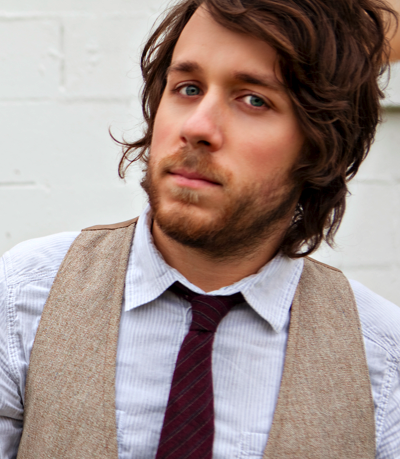 Upon graduation in May 2010, he and his wife, Nicole, plan to devote all of their efforts in pursuit of their music career as folk/pop duo, Elenowen. By all accounts, EMI’s Grammy party at the Hollywood “W” Hotel was impressive. 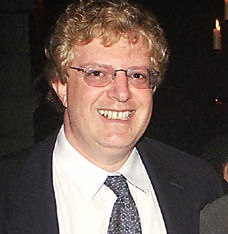 But one there was one significant absentee from the celebration: Guy Hands, Chief Executive of Terra Firma, the in vestment that purchased EMI in 2007. EMI is a British company with a 113 year history of making music. Globally, EMI is home to such well-known acts as Coldplay, Norah Jones, Snoop Dog, The Spice Girls, and even, yes, the Beatles. EMI’s Nashville-based labels are home to, among others, the Nashville’s successful talent, such as Lady Antebellum, Darius Rucker, and Keith Urban, not to mention old faithfuls such as singer-songwriter, Guy Clark, while the Nashville-based publishing arm of EMI is home to Tom Shapiro, John Paul White and Steve McEwan, to name a few. And then, there is the Nashville-based Christian side of the business, EMI’s Christian Music Group. Despite these success stories, in the days following the extravagant Grammy celebration, events transpired which called into question the financial stability, nay, even the very future, of those organizations as separate entities. The winds of change started blowing way back in 2007, when the struggling entertainment empire was purchased by Hands and his venture capital firm, Terra Firma, for somewhere around 6.5 billion U.S. dollars. The VC firm had a reputation for turning around troubled companies, including a roadside gas station company, an aircraft-leasing business, Australian cattle ranches, and a natural-gas network. Some of the $6.5 billion purchase price was funded by the investment group, but the remaining balance, somewhere in the range of 4 billion, was financed by Citigroup. 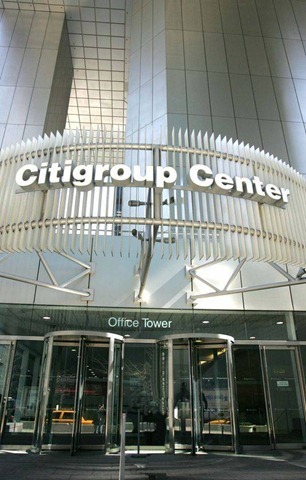 Citigroup’s agreement to lend out that much money was contingent upon performance level targets. The current consensus is that, despite over 13 million in sales of the old Beatles catalog, EMI has failed, and will continue to fail, to meet the performance targets, unless Terra Firma comes up with additional $200 million in capital contributions by the end of the summer. If that doesn’t happen, Citigroup, itself struggling from the weight of bad debt and government scrutiny, could take the keys to the company and then, likely flip it into the waiting arms of Warner Music CEO, Edgar Bronfman, who has long wanted the EMI pro perties, changing the landscape of the music industry. 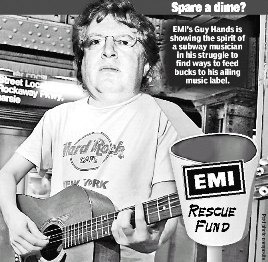 It is rumored that when Hands first met the EMI executive team, he told them if he didn’t make the deal work, he would lose over $310 million. So, for obvious reasons, Guy Hands didn’t attend the recent EMI soirée, choosing instead, I imagine, to remain in his lavish estate on the Isle of Guernsey in the English Channel, where taxes are almost non-existence, making it a popular financial center for British venture capitalists. Regardless of where Hands is now, however, this entire power struggle will likely play out by the end of the summer.